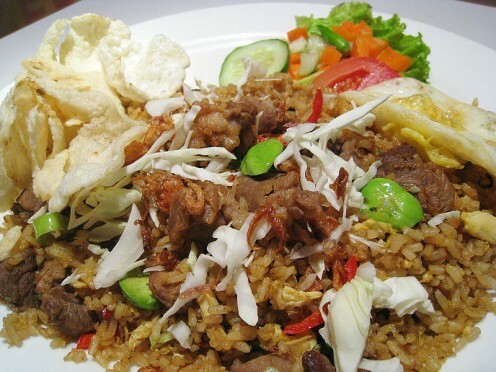 Nasi Goreng means fried rice in Indonesian and is the national dish of Indonesia. 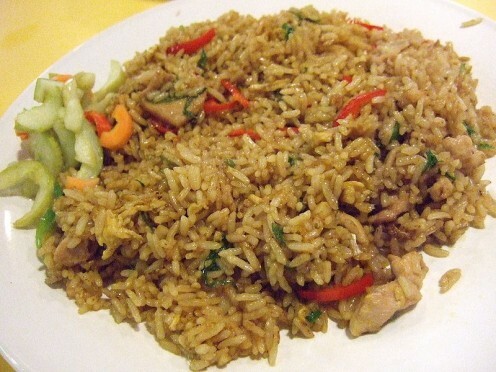 Nasi goreng is rice stir fried in some butter and most of the time vegetables and meat are added to the fry. Eggs are commonly used in nasi goreng. Nasi goreng is a complete meal as it has meat, vegetables and eggs and is normally only accompanied by a hot sauce or some lovely chili paste. This can be served for breakfast or for dinner. According to a survey by CNN nasi goreng is the second best tastiest dish in the WORLD. This will not be shocking for those who had tasted this mouth-watering, nose tingling dish. This dish can be easily found in 5 star hotel as well as in road side stalls! come prince, come pauper, lets enjoy nasi goreng on a platter. 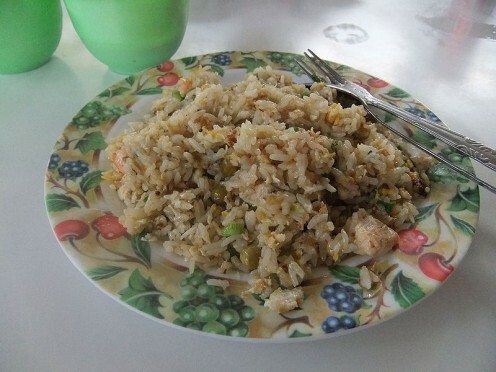 Nasi goreng is actually a dish made from left over rice from dinner and eaten for breakfast. This recipe needs cooked dry rice so it’s better not to make nasi goreng with freshly cooked rice as the rice will be soft and moist. Nasi goreng is made from cooled rice (should be cooled atleast for 4 hours best), some soya sauce, fish sauce, chili, garlic, spring onions, cucumbers, shallots and tomato. These are the basic ingredients but nasi goreng is made with a variety of ingredients, sauces and vegetables. My nasi goreng recipe has many ingredients but believe me it's worth the effort. This particular recipe has chicken, fish, cuttlefish, mutton, prawns and omelet too. Marinate the meat and fish in 5 separate bowls. Use 1/2 tsp. ajino moto, 1/2 tsp chili paste, 1/2 tsp salt and 1/2 tsp oil. For the cuttle fish add 1 tbsp. teriyaki sauce, for the chicken add 1 tbsp. kikoman sauce and for the fish add 1 tbsp. oyster sauce. Pour 1 tbsp of oil in a small pan and add the marinated chicken, mutton and prawns and stir fry for a minute. Cook rice with 1 cup of rice = 2 cups of water ratio. Add 1 tbsp. of salt. Add the stir fried chicken etc to the rice before cooking. Saute the cuttle fish and the fish in 1 tbsp. oil. Add 3 tbsp of chili paste, 1 1/2 tsp salt and 1/2 tsp ajino moto. Add the vegetables to this; everything other than the spring onion. Peppers, cabbage, carrot and mushroom. Add the tomato sauce and 1 tbsp kikoman sauce. Add the cooked rice to this saute and mix well. Add the spring onion give it a final toss and check for salt. Indonesian cuisine is widely influenced by countries such as India, Middle East, China and Europe. On the contrary Indonesia has influenced many other cuisines by the introduction of two of the main spices i.e. cloves and nutmeg. As Indonesia is an archipelago, the cuisine varies island to island. Indonesian cuisine uses less or no preserved food, so the dishes are fresh and healthy. The national dishes of Indonesia are Nasi goreng, Sate (a spicy barbecue served with peanut sauce), soto and gado-gado. Peanut sauce is commonly used in most Indonesian dishes. Rice is the staple food in Indonesia. 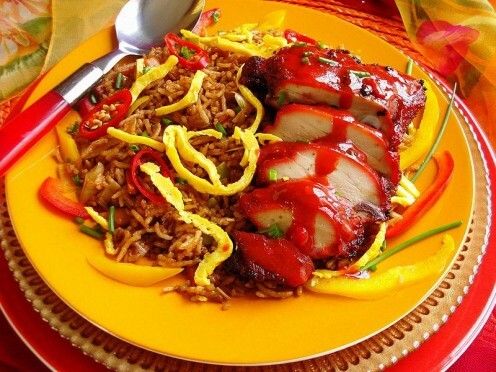 Rice is served in many varieties, savory and sweet, and is commonly eaten with the hands in some parts of the country. Rice is eaten plain with a few vegetable dishes, just like in the Sri Lankan cuisine. 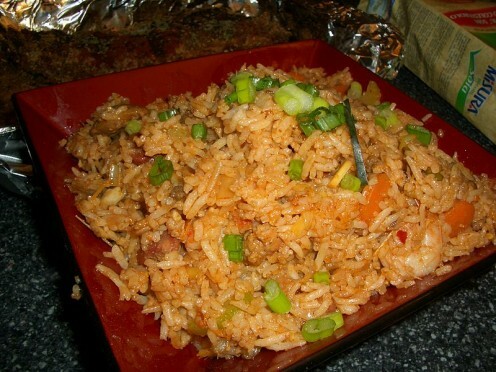 There are however many rice dishes that are native to Indonesia. Nasi uduk is rice cooked in coconut milk. Nasi kuning is rice cooked with coconut milk and turmeric. Ketupat is rice that is cooked in woven coconut fronds. Lontong is rice steamed in banana leaves. 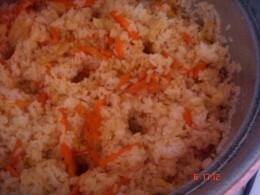 And nasi goreng is day old rice fried with vegetables, meat and sauce. Other than rice, Indonesians widely consume tubers like potato, yam and cassava, starchy fruits like bread fruit and jack, and grains like maize and wheat. Leafy vegetables are also used to make many side dishes. Kankung, spinach, cassava and papaya leaves are served sautéed in garlic. Tea and coffee is the common beverage served in Indonesian homes. Jasmine tea was famous throughout the country until green tea started appearing on headlines claiming it to be the best tea. Kupi susu is a hot drink that you should try out. It is coffee mixed with condensed sweet milk. In Indonesia poultry (chicken and duck) and fish are consumed more than meat. But all kinds of meat are found in the market. As Indonesia is a Muslim country, most islands don’t serve pork or other meat that are haraam (against the Islamic law). Indonesia is home to many kinds of fruits that are uncommon in any other part of the world. Fruits like rambutan, durian and mangosteen are unheard of in the western world. Fruits are either consumed fresh, juiced, cooked, baked or made into desserts. Rujak is a dish that is made up of spicy fruits (I want to try that out). Fruit chips (kripik) made from banana and jack fruit were common is Indonesia. Today chips are made out of many more fruits like apple, strawberry, dragon fruit, watermelon, and durian. Indonesians shop for meat and vegetables in the morning and cook late in the morning to be consumed for lunch and heated for dinner. Indonesians rarely freeze food to be consumed on another day, other than the sambal (a side dish like chili paste). Hope I made your mouth water and your heart ache to try out Indonesian cuisine. Thanks for a wonderful resource centre. I love rice dishes because they are gluten-free options so I have linked you to my recipes based on rice to help patients who are allergic to wheat or gluten.